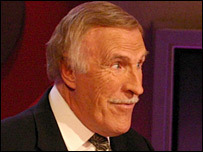 Bruce Forsyth, who has been made a CBE for services to entertainment, made his comeback on the BBC current affairs show Have I Got News For You two years ago. But it is the Generation Game and, latterly, Strictly Come Dancing for which the 77-year-old TV presenter remains best known. The son of a garage owner, Forsyth grew up in Edmonton, north London, and left school at the age of 14. He launched himself on the music hall circuit as Boy Bruce the Mighty Atom, with an act which included dancing, singing and playing the ukulele. He spent 20 years travelling the country, working seven days a week, performing in church halls, sleeping in luggage racks and waiting for his big break. By the time he received a request in 1958 to host TV series Sunday Night at the London Palladium, Forsyth was on the verge of leaving showbusiness. He was booked for two weeks, and ended up staying five years, by which time he was Britain's highest paid entertainer, earning £1,000 a week. His energy and enthusiasm saw Forsyth flourish in the 1970s as host of a succession of popular gameshows, including Play Your Cards Right and hit primetime show The Generation Game. 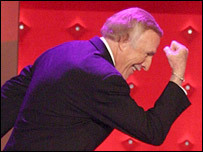 Also known as Bruce Forsyth's Generation Game, the show saw Forsyth coin the expression "nice to see you, to see you, nice" and marry TV hostess Anthea Redfern of "give us a twirl" fame. Despite presenting shows including Hot Streak, You Bet! and Big Night, Forsyth's career remains uniquely linked to The Generation Game. 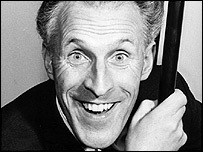 He left the show after six years in 1977, handing over to Larry Grayson, but returned in 1990 for another four-year stint. In 1994 Forsyth left the BBC to join ITV. The entertainer went on to repeat his TV success on long-running ITV quiz show Play Your Cards Right. He received a lifetime achievement award for variety at the British Comedy Awards in 1995 and was made an OBE in 1998, but in 1999 Play Your Cards Right was dropped. Forsyth's television renaissance began in 2003 when he appeared as a guest presenter on satirical BBC quiz show Have I Got News For You? In 2004, he presented the BBC One weekday quiz show Didn't They Do Well?, borrowing its title from another well-known Forsyth's catchphrase, before accepting the role as host on the celebrity dance show Strictly Come Dancing. Now in its third series, the show's success has seen the entertainer's fortunes revived, playing on his old-fashioned appeal. He earned his first National TV Awards nomination in 2004 and was the subject of a Bafta TV tribute. Now a great-grandfather, Forsyth has six children and lives in Surrey with his third wife Wilnelia, a former Miss World who is 30 years his junior.